When it comes to good health, food is incredibly important. That’s why we’re so excited to introduce Nourish, our exclusive guide to help support you on your personal health and wellness journey. Nourish is not a diet; it’s a lifestyle that revolves around eating pure, nutrient-dense, honest-to-goodness real foods. It’s designed to provide you with education, inspiration and support to help you make thoughtful food choices, explore new tastes and find balance in your life. Click on any of the 5 Elements icons below to learn more. As you walk through our stores, look for signs calling out foods and products that fit the Nourish lifestyle. We’ll also have experts hosting demonstrations who are ready to assist you to find foods and products that are right for you. Another great resource is our Nourish magazine, featuring many of our organic and natural products, recipes and more. Ready to fall in love with feeling great? Let’s get started! Find whole, pure foods to support a healthy lifestyle. Give your body the nutrients it needs by eating a colorful variety of foods. Explore a wide assortment of fresh and wholesome tastes. Support a healthy body with a boost of extra nutrients. Take time to slow down, find balance and eat well. 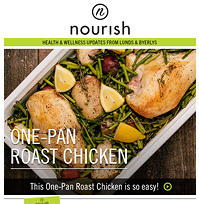 Sign up for our Nourish email newsletter. Discover new foods and flavors.